19 October 2010, at 9:48a.m. UK - A QX-like strain of infectious bronchitis causing losses in a flock of 46-day-old chickens is among the highlights of the Veterinary Laboratories Agency (VLA) Monthly Scanning Surveillance Report for August 2010. Poor weight gain from 21 to 28 weeks, a fall in production from 94 to 91 per cent and increased mortality (0.6 per cent in 12 weeks) was reported in a flock of 12,000 non-caged layers. Brachyspira pilosicoli was recovered following culture of a faeces sample. Increased mortality was reported in 26-day-old broilers, principally cockerels, in one of several houses containing 22,000 birds. Examination of the carcasses confirmed caecal coccidiosis with caeca distended with bloody content and profuse numbers of coccidial oocysts. Heart failure was also diagnosed with signs of excess clear fluid in the pericardial sacs and pulmonary congestion. An increase in culling due to lameness was occurring in two houses of 15,000 11-week-old broiler breeders. Clinical signs of lameness had been noticed for two weeks and birds had been 'going off their legs' with swollen hocks. Examination of culled birds revealed swelling of one or both hocks, which had increased quantities of joint fluid and surrounding subcutaneous oedema. Coagulase-positive staphylococcal species was consistently isolated from affected hock joints. Infectious bronchitis virus infection (QX strain) was detected in a submission of 46-day-old chickens. The unit of 50,000 birds had suffered a loss of 500 birds in two sheds over a period of four days. There were also suspicions that broiler sudden death syndrome / 'flip-over' may also have affected some of the birds. Infectious bronchitis virus was demonstrated in pooled trachea and lung samples. Five out of 10 of a group of pure bred chickens died over a six-month period with a history of malaise and going off their legs leading to death. The submitted bird showed distension of the proventriculus and gizzard which were filled with vegetable fibre and two olive green brown fruit-like structures with soft flesh surrounding an internal stone in the distal ileum. Gastrointestinal dysfunction was suspected and lead analysis of kidney showed a high lead value consistent with lead poisoning. The source of lead was confirmed as bonfire ash from the burning of an old white painted Victorian conservatory. Following a risk assessment visit the owner agreed to withhold eggs for consumption for 16-weeks and prevent access of birds to the material. A backyard chicken that had been being ill for two weeks and then suddenly deteriorated was presented for post mortem examination. 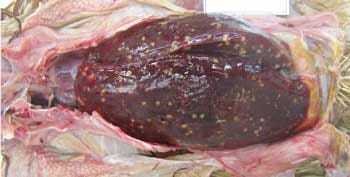 Necropsy revealed an enlarged, friable liver with miliary confluent white and yellow foci throughout its parenchyma (Figure 1). The spleen was also enlarged to a diameter of 3.5cm. Numerous beaded acid fast organisms were detected in a Ziehl-Nielsen stained section of the granulomas in the spleen confirming a Mycobacterial infection, probably avian TB. The owner was informed of the potential zoonotic risk. Avian spirochaetosis was diagnosed as the cause of death of 30 out of a group of 100 laying ducks. Histopathology revealed pallisading bacteria lining the surface of the caecal epithelium and the Brachyspira species were eventually identified as Brachyspira pilosicoli, thought to be a pathogenic strain. Avian intestinal spirochaetosis was diagnosed although underlying involvement of duck virus enteritis could not be totally ruled out. Spironucleus (Hexamita) infection was diagnosed in eight to nine-week-old pheasant poults which were described as dull, and showed yellow coloured droppings. The birds also showed poor feathering which would have impaired their ability to withstand the cooler, wetter weather conditions in mid-August. Ina another case, 100 deaths out of a group of 8,500, 11-week-old Red Legged partridges was attributed to protozoal infection (mixed Spironucleus, (Hexamita) and Trichomonas species) which were detected on wet smears of intestines. Poor condition was reported in two pens of partridges, associated with the presence of Capillaria sp. worms in the crop mucosa. Capillaria infections of the crop can be particularly debilitating in partridges. Mortality in adult pheasants was reported after they had been sold at the end of the breeding season. Twenty birds out of 1,000 had died. Post mortem examination showed evidence of kidney disease, with pale swollen kidneys and distended ureters, and a coronavirus was detected in caecal tonsil tissue which, accompanied by the histological finding of a severe tubulo-interstitial nephritis, indicated a likely diagnosis of coronavirus nephritis.